As bathrooms are becoming more of an integrated living space within our homes, clients are increasingly looking to individualise them, bringing textures and patterns into their schemes. Sometimes these are standalone looks or are created to tie in with other rooms in the house such as the bedroom. The most important factor to consider is… water! Bathrooms by their very nature are wet spaces, so think about fabrics which are easily washable for practicality. Of course if it’s a family bathroom you’ll be thinking about this from the word go. We recommend soft, washable rugs that can bring colour, texture and comfort to a tiled floor. Storage baskets of various fabrics and colours are widely available to compliment every colour scheme and are also a great way to store rolled up towels and toiletries. In a larger bathroom with good extraction, fabrics can work and bring a feel of opulence and comfort. If you have room for an upholstered chair or window seat in a fabric to compliment your scheme this can look great. Check out the chair and dressing table stool in our stunning master wetroom in Chuck Hatch here and the bay window seat cushion in this bathroom, to see how this look can work really well. Soft furnishings really up ante on the boutique bathroom look and will encourage you to use the room to relax in as well as wash.
Curtains and blinds are important if privacy is an issue. These don’t need to be made from brand new fabric as vintage finds and with embroidery or exotic prints can have real impact. 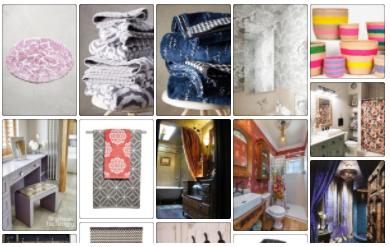 Don’t be tempted to only consider plain white bath towels as there are some great patterned ones available. They can work well to add a pop of interest in a monochrome scheme or to provide more interest in bohemian, eclectic space.